Like the Senate and House races, 36 gubernatorial campaigns are also drawing to conclusion this week, and in as tight a fashion as the US Senate races that have dominated the political landscape. Republicans hold a 29 to 21 advantage in the national gubernatorial division, but Democrats appear poised to gain a small number of state houses in this election. Strong competition is underway in 20 of the 36 states, a very high number. Nine races are thought to be too close to call headed into Election Day. The tightest of all, not surprisingly, may be in Florida, where Gov. Rick Scott (R) and ex-Gov. Charlie Crist (D) are doing battle. Florida, as we know, is no stranger to tight campaigns, and the Sunshine State electorate will almost assuredly give us another one this year. The Scott-Crist race is a flat tie, with multiple polls yielding each candidate a very small lead. Democrats feel they have the ground game to win a close race, but Scott has the clear momentum fighting back from very poor approval ratings to force the race to a virtual draw. One campaign that likely won’t be close is the Democratic conversion of Pennsylvania. Gov. Tom Corbett (R) has virtually no victory path and has trailed Democratic businessman Tom Wolf for the entire general election cycle, usually by double-digits. Several polls were released yesterday that bring some clarity to key races, most of which are considered sleepers or opportunity races for one side or the other. Republicans talk about their chances to convert the western district of Maine (ME-2), the open seat vacated by Rep. Mike Michaud’s (D) run for governor. Democrats believe they have found a strong candidate to challenge Rep. Steve King (R) in Iowa, and the open NJ-3 seat is also high on the Democrats’ opportunity list. The polling data seems to favor the incumbents’ party in each of these instances, however. A new Pan Atlantic SMS poll (Sept. 23-29; 200 likely ME-2 voters) gives Democratic state Sen. Emily Cain a 36-33 percent lead over former state Treasurer Bruce Poliquin (R). Subtracting leaners, Cain’s lead falls to 31-29 percent. Independent Blaine Richardson tallies six percent. The poll is part of a statewide survey of 400 Maine voters, so the 2nd District questions are asked of a polling segment. With a low sample size and a long interview period, the error factor is quite high, therefore, all we can legitimately deduce from the data is that the race is very close. In our ongoing search to find intriguing campaigns below the political radar, we see two congressional races gaining more credibility. Though specific polling data now shows upset possibilities for a Maine Republican and an Iowa Democrat, just how reliable are the results? Iraq War veteran Jim Mowrer (D) has captured some previous national attention with his prodigious fundraising in his battle with six-term western Iowa Rep. Steve King (R). Now well on his way to raising $2 million for his challenge campaign against King, a new poll gives Mowrer confirmation that he is positioning himself in upset territory. DFM Research, a Minneapolis Democratic polling firm, conducted a 4th District survey for the Sheet Metal, Air, Rail, and Transportation Union (Sept. 20-23; 450 IA-4 residents) largely for purposes of questioning people about transportation issues, specifically surrounding rail. The congressional and US Senate questions were of secondary importance. Because of that, the data contains some glaring political weaknesses. The irony of House Majority Leader Eric Cantor (R-VA-7) losing his primary election last night when several hundred miles to the south Sen. Lindsey Graham (R-SC), long known for his trouble within the Republican base, would defeat a field of six opponents with 56 percent of the vote, must be acknowledged. Even as late as yesterday, most people would not have believed such a predicted outcome. Yet, it happened. Cantor lost for varying reasons. First, his perceived position of supporting amnesty as part of the immigration issue proved a lightning rod against him within the conservative base. Second, the majority of his central Virginia Republican electorate clearly believed he is part of the problem in Washington. If a group of California citizens get their way, massive change will envelop the national presidential election process. Yesterday, this group of individuals launched the “Make Our Vote Count” campaign by filing a Request for Title and Summary with the California attorney general’s office, attempting to begin the process of qualifying a voter initiative that, if adopted, would cause the state’s 55 Electoral College votes to be awarded on a proportional basis. According to the filing language, the new system would distribute electoral votes to the individual presidential candidates consistent with their statewide vote percentage earned, rounded to the nearest whole number. From time to time, talk arises about states splitting their Electoral College votes, either as a way to gain partisan advantage or simply to make themselves more important in the general election. Now that the 2013 election is complete, the pollsters are back surveying races in states other than New Jersey and Virginia. Today, we cover some interesting numbers being returned in three competitive governors’ races. After seeing strong numbers come from Quinnipiac University in June (June 18-23; 941 registered Ohio voters) for Gov. John Kasich (R), the new Public Policy Polling data brings the race back to earth. Four and one-half months ago, the Q-Poll posted Gov. Kasich to a 47-33 percent lead over Cuyahoga County Executive Ed FitzGerald (D). The latest PPP survey (Nov. 5-6; 595 registered Ohio voters) paints a different picture. According to this poll, Kasich and FitzGerald are tied at 41 percent apiece. The latter data, which is much closer to normal Ohio voting patterns than the earlier Q-Poll, may suggest the pro-Kasich data is an anomaly or simply that the climate has changed during the lagging interval. Most probably, the time scenario is the more accurate. The 2014 gubernatorial cycle is shaping up to become one of the most competitive in recent years. Now that the 2013 governors’ races are in the books, it’s a good time to look at the state chief executives from a national political perspective. At the beginning of the cycle, the Republicans held 30 state houses versus 20 for the Democrats, the best GOP showing in the modern political era. With Terry McAuliffe’s victory in the Virginia open race last week, Democrats have already gained one governor’s post, meaning the updated margin is now 29R-21D. 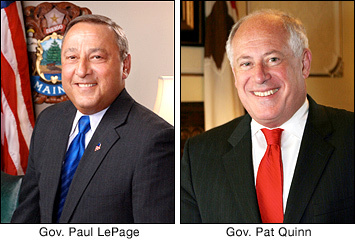 A pair of recent political polls confirm that Maine Gov. Paul LePage (R) and Illinois chief executive Pat Quinn (D) are in tenuous re-election position, meaning losing is a distinct possibility for each. Both face major tests from several opponents and, according to Public Policy Polling (ME) and We Ask America (IL), the challengers either today have, or likely could soon possess, the upper hand. PPP surveyed the Maine electorate (Aug. 23-25; 953 registered Maine voters) and determined that recently announced gubernatorial candidate, Rep. Mike Michaud (D-ME-2) is leading Gov. LePage 39-35 percent, with Independent attorney Eliot Cutler drawing 18 percent. Back in 2010, LePage defeated Cutler 38-36 percent, with Democrat Libby Mitchell only securing 19 percent of the vote. Since the governor has never topped 40 percent in any election or poll, the three-way configuration does give him hope of winning a second term. And, with a job approval index of 39:56 percent, being only four points behind in a survey conducted on the heels of his main opponent’s announcement tour certainly suggests the governor retains at least a rocky path to victory. But, the news is not all favorable for Michaud. Considering that the congressman’s personal favorability index is a strong 53:30 percent, almost opposite that of LePage, it is surprising that his lead is only four points. Combining the elements of taking a poll just after his post-announcement tour, and brandishing a favorability rating that is net 40 points better than the incumbent’s suggests that Michaud still has much work to do if he is to unseat LePage. Additionally, as he did during the last election, Cutler is transforming into a viable wild-card candidate. Overcoming a 21-point deficit this early in the campaign cycle is a difficult, but not insurmountable task.